The Mediterranean-style Muckenthaler villa was first a family home and is now a cultural center for the arts. Built in 1924, the 18-room villa is situated on 8.5 acres atop a Fullerton hill that was selected for its picturesque views of orchards to the south. Walter Muckenthaler and his wife, the former Adella Kraemer, lived there for more than 30 years, where they entertained friends, family, and dignitaries in landscaped gardens, bred rare birds, and enjoyed life as respected community members in a growing Orange County town. In 1965, seven years after Walter's passing, Harold Muckenthaler, the couple's only son, wished to have his childhood home utilized as a cultural center for the public and donated the house and property to the city of Fullerton. In 1999, the Muckenthaler villa received designation by the National Register of Historic Places. Today, tens of thousands of annual visitors enjoy the distinctive architecture, gardens, and grounds of the Muckenthaler Cultural Center, as well as unique art exhibitions, theater, music, dance, storytelling, classes, and seasonal festivals. 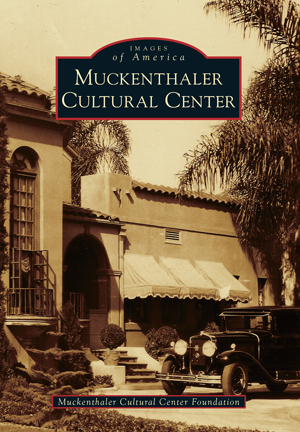 The Muckenthaler Cultural Center maintains a collection of historic photographs and artifacts and tells the story of this historic villa and its original family in many never-before-seen images.